How many times have you filled out an online form and waited hours or even days for the company to respond to your inquiry? It’s frustrating, and if you’re anything like me you’ll probably start looking into other options after a short period of time. It makes the business you were interested in appear to be unorganized and uninterested in your business. The good news is that CallTrackingMetrics’ click-to-call form (the FormReactor) makes it incredibly easy for businesses to immediately follow up on form leads coming from their website. The FormReactor is a powerful tool that can help drive better quality leads for businesses, enable agents and call centers to seal the deal while the lead is still hot, and ultimately increase sales. In an effort to help raise awareness on this feature that is already available to CallTrackingMetrics’ customers, we did our own experiment with the FormReactor and also interviewed customers who have used it. First, what is the FormReactor? It’s a tool included in all CallTrackingMetrics’ plans. It allows businesses to create a custom click-to-call form for their website and landing pages. Every time a potential customer fills out the form, as soon as they click the submit button, the form reacts and automatically calls the business and alerts the answering agent with a custom whisper letting them know there’s been a FormReactor submission. 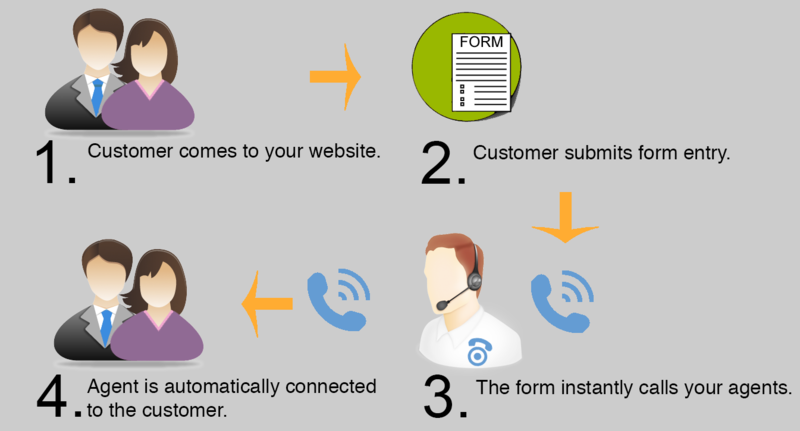 Once the agent accepts the call, the FormReactor automatically connects the agent to an outbound call to the customer who submitted the form. This is a win-win scenario, the customer receives excellent and speedy customer service and the agent is able contact the customer at the instant they were interested in the product. In our own experiments with the FormReactor, we embedded the form in our Google Adwords landing pages with the calls going directly to our sales department. Our sales team was very pleased with it, saying, “The clients were often impressed with the speedy response and it allowed us to provide in depth information on our product before they lost interest”. To get started, existing CallTrackingMetrics customers can simply go to the FormReactor page within Account Settings and start building their form. To become a customer, visit CallTrackingMetrics’ website to sign up. The FormReactor is available through all 4 of CTM’s plans. If you’d like your company to be featured in one of our upcoming blogs please contact Jessica@calltrackingmetrics.com.